What is it about a big juicy steak that puts a guy in the right mood to talk? 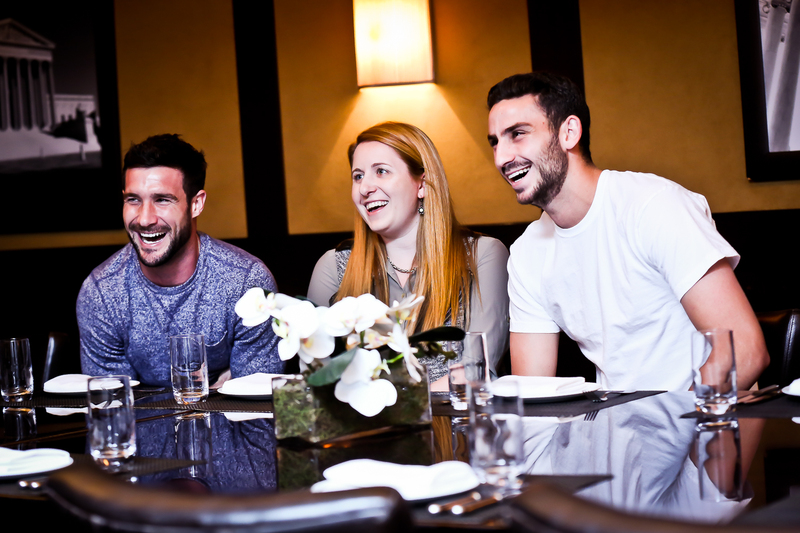 I haven’t solved that yet, but thankfully BLT Steak provided just the right atmosphere, and that perfect filet, to put D.C. United defender Steve Birnbaum and midfielder Chris Pontius in a loquacious mood. With all the friendly competition and playful ribs exchanged, I would have thought the teammates were brothers, but it turns out they are just roommates. Over the course of lunch, Pontius and Birnbaum spoke openly about their lives on and off the field, and revealed some little-known D.C. United factoids, such as the team’s reigning Ping Pong champion, the mandatory attire of a post-win night out on the town and how they adjusted from playing with to playing for coach Olsen. Have either of you eaten here before? Steve Birnbaum: Once, with my mom. I’ve heard it’s [Coach] Ben’s favorite though. That’s a great date spot. What are some of your favorite places to eat around town? CP: Barcelona is my place.I am more of a tapas guy. Boqueria is another good one. SB: Rays the Steaks is good. We order a Tuna Tartare starter for the table. Pontius and Birnbaum both order the 12 oz. filet with classic and horseradish sauces respectively, and I order a grilled Wagyu skirt steak salad. You are both from California. what were your first impressions of Washington, D.C.? CP: To be honest, I was a bit culture shocked. I came from Santa Barbara and the pace of life was just a bit slower. I’ve been here for seven years, and I think I really started to embrace the city by my third year. I was more adventurous in going out and making new friends, especially outside of soccer. When I had that escape to not be talking about soccer all day, I started enjoying the city more. SB: The weather was the biggest shock for me. It snowed until April, I think, the first winter I was here. It probably took about six months to settle in. But I was lucky, coming in with some great guys – we had basically a whole new team that year, so we were all in it together. Chris and I bonded being from Orange County and we hit it off right away. Living in Northern Virginia I don’t know as much of the city as I’d like to. My goal this year is to get out more in the city and try new restaurants. SB: We recently got into golf. CP: When he says we “got into it,” we are not good. Let’s just clarify that. SB: True. We go out and we have a little foursome through our team with Taylor Kemp and Davy Arnaud. Those guys have been playing for a while. Pretty much whenever we have a day off, we’ll hit the links. CP: Chris: It’s a love-hate relationship. I like to bike around the city a lot. Last year when I was injured, I used it as my fitness. I would bike all the way out to Mount Vernon and back. It’s a great way to see the city. What is a typical week like when you are in season? CP: It kind of depends on where we are in the season, or if we are winning since we get more days off when we are winning. But say we have a home game on Saturday, we’ll generally come in Monday around 8:15 a.m. for the injured players and 9:15 for training players. We’ll watch video or have a meeting at 9:45 and then head to the training field. We’ll be back at the stadium around noon for a lifting session or yoga. We typically hang out together afterwards, rather than racing back to our apartments. We might play some ping-pong or what not. We’ll be back for training Thursday/Friday and game on Saturday. Who is the team ping-pong champ? CP: I’m the Duke in this scenario. SB: I think there’s a pretty general consensus that Chris Rolfe is the best player. CP: Oh, he is the best ping-pong player. He’s the Kentucky. SB: We have tournaments once or twice throughout the year, but we have a league that runs basically the full year. It sounds like a pretty fun atmosphere. Is that the normal vibe amongst the team? CP: You want to keep it as lively as possible in the locker room. As the season wears on, especially with our season being so long, it can feel like coming in is a chore. I know we are very blessed and lucky to be doing what we do, but it does get strenuous at times. So these are things on the side that keep you a little more motivated to come in and get to work. SB: It keeps the guys close and interested and competitive. We’re always competitive. What is your favorite event you have attended since being in Washington? CP: Sneaker Ball, for sure! I’ve been three or four times and enjoyed it every time. Light the Night with LLS is cool too, to see so many people out there supporting the cause. My dad had leukemia, so that’s my connection. He beat it though, so that’s good. SB: Becky’s Fund was a great event, I loved that one. CP: I walked in that fashion show and Steve was my date. Chris Baker was hysterical! How do you find the dating and social scene here? SB: I am recently single, and I’ve found people are more welcoming here than I thought in the beginning. They might be more willing to talk to you than in California actually. CP: I’ve only had one girlfriend that I’ve dated from D.C. I guess there are a lot of opportunities now for dating, but we don’t have the benefit of work happy hours, since we are in a locker room with 28 guys most of the time. Most 9 to 5 jobs give you the chance to meet friends of friends and date. If you weren’t playing soccer now, what would you be doing? CP: Politics. Ha, no, I’d be involved in soccer at some level I think. I’ve spent so much time in the sport throughout my life that it would be hard to leave completely. I’m planning on doing my coaching license this off-season just to keep the option open, but I don’t know yet if that is the path I’d go. SB: I’ve always wanted to do something in marketing or advertising for sports. That was my plan if soccer didn’t work out after college. Even doing that for MLS after my career is done would be amazing. Do you remember a moment where you knew soccer could be a career option? SB: Probably freshman year of high school. I started getting called into youth national soccer camps, and meeting guys that were professionals and I thought “wow this could be a thing” and I really committed to it. CP: That’s a lot earlier than me. I was in junior year of college probably. We won national champs my sophomore year, but I wasn’t a star on that team or anything. I started peaking some interest my junior year, from MLS teams mainly. I wasn’t thinking about it as a way to go pro, I just couldn’t have imagined my college experience without soccer or the team. The current season started on a record high-note, with Wins in three of the first four games. But there were also several late-in-the-game scores to clinch dramatic wins. What is the feeling in the locker room right now? CP: It hasn’t been pretty the first four weeks. We’ve had one game where I thought we played well. But when you can grind out victories when you aren’t playing well, that shows the true character of a team. But I wouldn’t say we are happy with just winning ugly. We are always talking improvement. SB: It’s always great to get the win. No matter what, a win’s a win. But it’s tense at the end of a game if its 0-0 and we come out with a late goal. We are elated in the moment though. CP: Might not be so elated reviewing film. SB: Exactly, we realize we have a lot to do to prepare for the next one. Who do you admire most within the D.C. United franchise? SB: It has to be Ben [Olsen] in my opinion. He has such a history with D.C. United, having had a great career here and now as the coach. We go on the field wanting to win for him. He is so passionate about winning because he wants to bring winning to this city, and to the fans he has been around for so long. He has a connection to our fans that I don’t think most coaches have, having played for them not long ago. CP: I was fortunate enough to play with Benny for a year and I saw that passion first hand. It can be tough going from playing with guys to coaching them. But for me, it wasn’t an issue crossing because he demanded that respect as a player as well. On top of that, he understands what we go through as players and approaches us from that angle. Through my injuries, he would always ask me what I was doing to keep myself happy off the field. He cared for my well being as a person, not just a player. Best night out in D.C.? CP: We did a thing on Sundays last year, after wins, and we wore cat shirts out. It was a conversation starter. SB: We are looking for ideas for this year. CP: Overalls were thrown out there. SB: Concert for Valor. We went together. CP: Steve and I thought we were Eminem .We cleared people out with our rapping. SB: Old school rap: Biggie, Tupac, Eminem.